On this week’s Consuelo Mack WealthTrack, Consuelo talks to one of Wall Street’s top investment strategists, Francois Trahan about why he believes the dollar is key to understanding stock market performance this year. 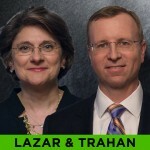 Learn how to take advantage of the dollar, in weakness and in strength, with Wolfe Trahan’s Chief Investment Strategist. However, there are market practitioners who have a better grasp than most of market behavior. One of them is our guest on WealthTrack this week. He is Francois Trahan, the head of portfolio strategy and quantitative research at research boutique, Wolfe Trahan who has been voted the Street’s top portfolio strategist by Institutional Investormagazine for the past three years. Deciphering the mysteries of market behavior requires a potent mix of science, art, skill, luck, and in this day and age, massive amounts of data and computing power. It also requires an understanding of global economic, business, and political events and trends. If investors have learned anything through the financial ups and downs of the last couple of years, it is that “macro matters”, perhaps now more than ever. 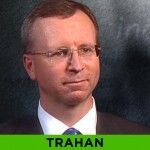 One of the most fascinating charts that Trahan has produced recently shows just how much macro matters. We’ll show it to you on WealthTrack this weekend. What it will illustrate is that financial, political and policy events such as the European debt crisis, leading economic indicators, Bernanke’s speeches, the U.S. election and the extension of Bush’s tax cuts heavily influenced stock market behavior last year. According to Trahan, 90% of the stock market’s performance was attributable to such events, versus a long term average of 71%, whereas stock specific influences only accounted for 10% of stock returns, versus 28% historically. As Trahan points out, most professional investors spend the bulk of their time on company specific information. Maybe it behooves us and them to pay more attention to the big picture. The other thought provoking chart Trahan shares with us this week shows the close correlation that has emerged between the dollar, the U.S. stock market and oil prices. The pattern that emerges is when the dollar declines, the stock market and oil prices generally go up, whereas when the dollar rises, the stock market and oil prices go down. I’ll ask Trahan why this correlation has become so tight, as high as he has ever seen it, and why he believes it is so important to investors. Macro events certainly exerted some influence this week.The Wall Street Journal’s market headline tonight reads, “Dow Slips on China Data.” The story is that the Chinese economy unexpectedly accelerated to 9.8% annual growth in the fourth quarter, raising fears that the Chinese government would hike interest rates again to slow its growth and fend off inflation. China’s economy grew 10.3% last year, the fastest pace in three years. (China probably surpassed Japan as the world’s second largest economy.) As guest Ed Hyman told us last week and Francois Trahan will comment on this week, the Chinese seem to have an innate antipathy to inflation at around the 5% level, close to where it is now, (5.1% in November and 4.6% in December) and they do not hesitate to act to curb it. Energy stocks and emerging markets also fell on China’s economic report and the Shanghai Composite lost nearly 3%. Worries about Chinese tightening also affected commodity markets today. As Bloomberg’s headline read tonight, “Oil falls Most in Nine Weeks on China Rate Concern.” Oil fell $2.00 to $88.86 a barrel today on the New York Mercantile Exchange. It is still up 14% on the year. Other commodities weakened as well. The potential damage to the U.S. stock market was offset by some upbeat developments. Existing home sales jumped to a seven-month high in December, up 12% to a 5.28 million annual rate. However, weakness remains. The median price of a home dropped 1% from a year ago to $168,800 and the percentage of sales from foreclosures increased. Last year existing home sales decreased to 4.91 million, the lowest since 1997. The other positives today were a jump in the index of leading economic indicators, a key stock market gauge according to Trahan, and first time claims for unemployment benefits fell. Market observers attributed jumps in both Home Depot and Walmart shares to those positive reports. But don’t kid yourself, specific company news still moves stocks. Morgan Stanley’s shares rose 4.6% on a 35% gain in fourth quarter profits and record revenues from its Morgan Stanley Smith Barney brokerage unit, now the world’s largest. Wendy’s/Arby’s Group advanced 6.9% after confirming it is exploring the sale of Arby’s, and Dillard’s department store jumped 12% on plans to form a real-estate investment trust. I had the pleasure of moderating a panel with threeWealthTrack “Great Investor” guests yesterday. Legg Mason Capital Management’s Bill Miller, ClearBridge Advisors’ Hersh Cohen and the Royce Fund’s Chuck Royce. All three pay attention to the big picture but their focus is on bottom up analysis. They make money the old fashioned way by examining the management, culture, business, financials and competitive positions of each of their investments. One of the themes they share in common right how is their focus on balance sheet quality and dividend policies. They all agreed that paying dividends has become a significant corporate governance issue, a measure of how shareholder “friendly” management is, and also, that in a modest stock return environment, dividends are key to delivering above average performance. Incidentally, if all goes according to plan, I will be interviewing small cap investment legend, Chuck Royce for a rare TV appearance on WealthTrack the weekend of Friday, February 4th. 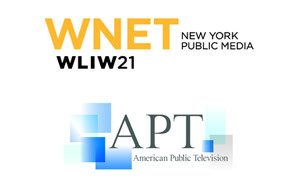 As always, if you miss this week’s program, it will be available on our website, starting on Saturday. For those of you interested, I will be twittering tomorrow under my nameConsueloMack. 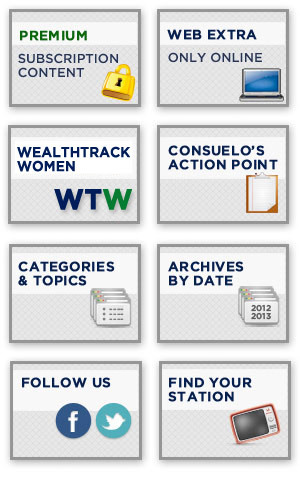 For those of you active on Facebook, thank you for contacting us on our Consuelo Mack WealthTrack page. Have a terrific weekend and make the week ahead a profitable and a productive one!